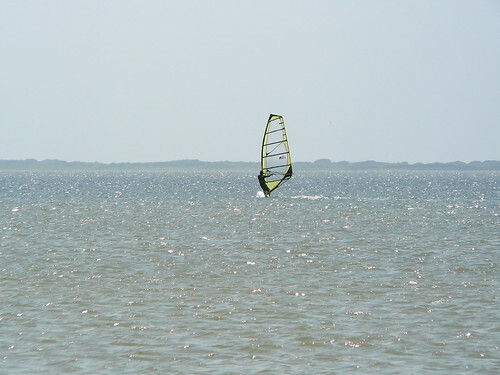 How does a November 16-18 windsurfing trip to Corpus Christi sound? This looks like the only realistic weekend for a trip in November. The records indicate an average high of about 75 degrees F that time of year. Many folks will want to rent a wetsuit. Still, 75 degrees isn't too much colder than the pleasant weather we surfed in last weekend. Chime in with a comment. I'll plan a trip if I see some demand. Also comment if you have interest in an international trip. Bonaire? Australia? Elsewhere? 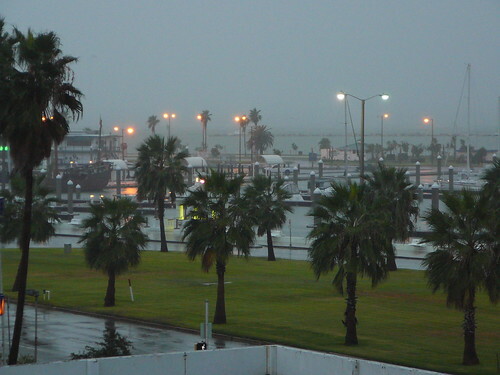 I woke early Saturday to watch a storm pass through downtown Corpus Christi. After the storm left, I got coffee and breakfast at Agua Java. When I arrived at Worldwinds, the wind blew weakly, maybe 6-10 MPH. Storms floated on the horizon, occasionally distant thunder could be heard. I rented their new Fanatic Shark 145 liter board and a giant 7.5 meter sail. The 7.5 is the largest sail I've ever used. I guess I'm getting used to big sails -- it didn't seem too much larger than the 7.0. The Fanatic Shark had an interesting contraption to protect the nose. Rather than a hard plastic bumper on the front of the board, the board was equipped with a device attached to the mast base -- the deviator. This little gizmo is basically a little raised projection with a roller on top. If the mast falls towards the front of the board, the device deflects the mast away from the nose. The deviator works well, and definitely looks nicer than a nose protector. But it also makes it much more difficult to lift the mast over the nose when in the water -- you have to lift it much higher to clear the roller. The Fanatic was a fine light wind board. Despite the iffy wind, I let the fun of sailing lure me out well past the buoys. I was alright for perhaps an hour before the storms got closer and the wind started acting shifty. At that point I started tacking back in towards Worldwinds. I got perhaps half way back to Worldwinds when I lost power in the sail. I figured that the wind must have changed directions, so I tacked. The tack went fine, but I still had no power. I tacked again. And again. And again. No luck. The wind seemed to have vanished. Oh no. I jumped off the board and started swimming in. As I was swimming back in with the mast over my shoulders, I watched the storm move closer. It looked like I might get rained on. I continued inching towards shore where there was a bit of a crowd -- how embarrassing. As I continued swimming, I felt a little breeze on my face. Would the wind save me? I turned to look in the direction of the breeze -- and storm. As I watched, a sheet of darkness moved across the water towards me. Wind. Maybe 30 mph. Maybe 100. Either way, it immediately stirred up a nasty chop. I decided not to attempt a waterstart. I thought my 7.5 meter sail might launch me to Mexico. I climbed on the board and uphauled. A gust immediately tore the sail from my hands. I uphauled again and was thrown from the board. Frustrated, I floated in the water collecting my wits. Third time's the charm, right? I climbed up, hoisted the sail, and quickly hooked onto the boom with a two-hand death grip. Even without sheeting in, the board started moving. Somehow I managed the sail by staying back and low, cutting as much upwind as possible. The board rocketed forward and covered the remaining distance to Worldwinds in seconds. If I had sheeted in more, I probably could have shot up the ramp and into the garage. I was just happy not to have to swim any more. Now I know what the calm before the storm is. Lesson learned: stay close to shore in weak wind and stormy weather. I would have kissed the ground if it wasn't so dirty. As I left Worldwinds, I learned that Matt and Karen, Justin and Yun all decided to skip the beach today on account of the storm. I returned to the hotel to clean up. Afterwards, I met them all for dinner at the Water Street Oyster Bar. Afterwards, we had a few drinks at Havana. 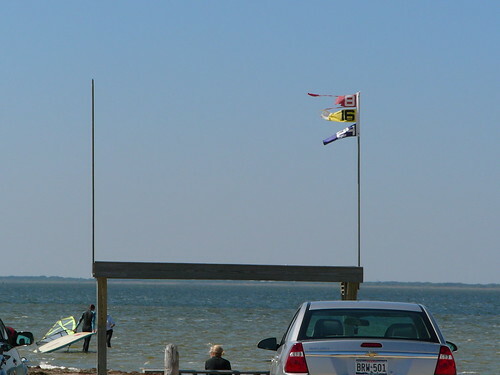 Friday's weather was perfect for windsurfing. The wind blew around 25 gusting to 29 MPH. Unfortunately, I was the only one in our group arrived Friday. Their loss. The Worldwinds staff agreed that it was the best windsurfing day they'd had in a month. After a little practice on the JP X-cite Ride 145 and a 6.0 meter sail, I took the waterstart class with Olivier. He also gave me some pointers on my beach start and getting into the front footstrap. For the beachstart, his biggest hint was to keep the boom close to the body. The boom is supposed to do all the work as you gradually twist the sail into the wind. Yanking on the boom and jumping on the board is poor form. In waterstarting, the ah-ha moment was turning my hips forward as I get pulled out of the water. With the hips forward, it becomes possible to collapse the back leg to pull the board into position under the body. The motion of the arms in the waterstart is very similar to the beachstart except the arms are above the head. Again, the front arm pushes forward and out as the back hand sheets in. Once the sail is just right, you pop out of the water. The back leg pulls the board under your body, and the front foot lands on the board. I tried getting into the front foot strap a few times, but never quite managed it. I get my foot right next to the strap, but I keep unintentionally sheeting out as I concentrate on my feet. If I can get one more day of good planing wind to practice, I think I can make it. Ladies and Gentlemen, we sail October 26. As usual, I'll be leaving at 7am on Friday. That way we can enjoy a full day of surfing all three days. If you're a new recruit, you can get a feel for the experience by reading the previous trip posts on the blog. This is your to-do list. Get this stuff done early so you can relax. Worldwinds treats us very well. As a courtesy to them please follow through with your class and board rental reservations ASAP. Please don't procrastinate -- hotel rooms and classes can fill fast. If you have an invite please respond. If you want to get added to the invite list, send a mail to john AT windaddict dot com. 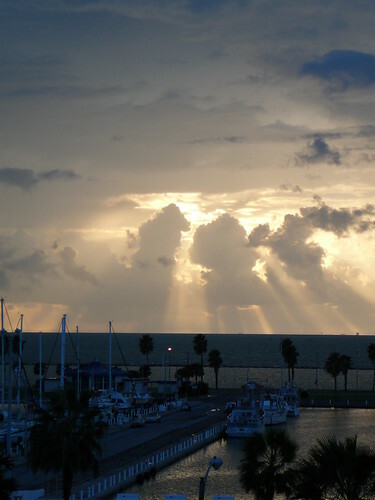 Make reservations at a downtown hotel like the Best Western Marina Grand hotel, the Bayfront Plaza, the Omni, or arrange to share a room with someone. Check in on 26 October, checkout on the 28th. 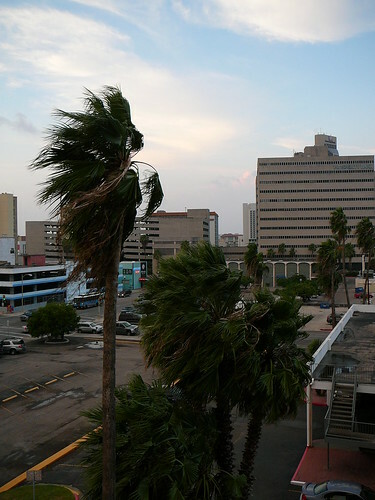 You may wish to try bidding on a hotel on Priceline -- downtown Corpus is the "Corpus Christi Beach Area". You are responsible for your own hotel reservation. Call Worldwinds at 1-800-793-7471 to schedule your classes and reserve a board for the weekend. You are responsible for reserving your own board and classes. Please tell them that you're with John Knox's group. My currently suggested class sequence is as follows: beginner, intermediate, harness, beach start, fast tack, planing in the harness. If you're planning on taking a class other than the beginner, please give yourself an hour or two to practice before the class. You don't want to be struggling with the basics while you're trying to learn a new skill.